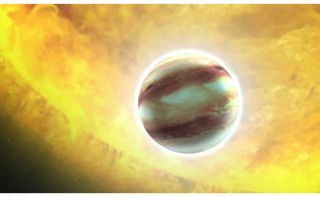 This is an artist's concept of a "hot Jupiter" planet known as HAT-P-7b. This planet orbits a star that is much hotter than our sun. The inward migration of huge alien worlds may be slowed by the presence of "planet traps" in the disks of dust and gas around their stars, a new study reports. These traps could explain the presence of boiling-hot gas giants known as "hot Jupiters," which current formation models predict should have spiraled into their parent stars long ago due to a process known as Type I migration. Hasegawa and co-author Ralph Pudritz, also of McMaster University, simulated planet traps in growing disks to determine their role in slowing the inward migration of newly formed alien worlds. After a star forms, a disk of dust and gas remains in orbit around it. Bits and pieces of the disk clump together to form planets, or planetary cores. Sometimes, these cores migrate inward. Current simulations of planetary formationsuggest that such inward-bound bodies should spiral into their star within a million years, but the hot Jupiters observed by astronomers are far older. Hot Jupiters have masses similar to Jupiter in our own solar systembut lie far closer to their host stars, with some orbiting closer than Mercury. While Jupiter kept its distance from the sun, other inward-traveling gas giants could potentially kick smaller, Earth-like planets out of their systemscompletely. Sudden changes in the surface density or temperature of the disk can create planet traps, which snare the spiraling cores. The planet traps themselves move closer to the star, but at a far slower pace than the cores alone would travel, researchers said. The planet traps don't slow down the growth of the core — just its movement toward the star. While trapped, a core continues to attract dust and rock, growing steadilyin a process known as accretion. Eventually, the core reaches sufficient size to escape. "Once the mass of the cores is large enough — roughly larger than 10 Earth-masses — and a gap is opened in the disk, then the cores will drop out from their traps," Hasegawa said. At such masses, the cores rapidly clear a gap in the disk and begin Type II migration, moving inward as material enters their newly cleared path, though at a far slower pace than during Type I migration. Type II migration ends when most of the disk has been turned into planets or cleared out. Disks with higher accretion rates form planetary traps farther from the star. As a result, planet cores in rapidly accreting disks drop out at around 10 times the distance of the Earth from the sun (known as 1 astronomical unit, or AU; this distance is roughly 93 million miles, or 150 million kilometers), while disks where the material gathers more slowly may result in cores exiting traps at 1 to 5 AUs. "The observations of exoplanets suggest that observed gas giants seem to be piled up at around 1 AU," Hasegawa said. "The pileup of gas giants is natural if planet traps play a role." Hasegawa's and Pudritz' work was published in the Nov. 20 issue of the Astrophysical Journal. Hot gas giants may not be the only exoplanets affected by planet traps. According to the new research, massive rocky planets known as super-Earthsand smaller, close gas giants known as hot Neptunes may also be affected. According to Hasegawa, the only difference between hot Neptunesand super-Earths and their cousins, hot Jupiters, is the final stage of gas accretion, where the gassy atmosphere is collected. Otherwise, they suffer the same results of Type I and II migration. "Since super-Earths and hot Neptunes are low-mass planets, they cannot go into the gas accretion," Hasegawa said. "In other words, they are 'failed' gas giants."